Monday was St. Patrick’s Day, and since you’re a hockey fan, I’m just going to go ahead and assume you’re hungover right now. And that’s fine, because we’re going to keep it light today with a St. Patrick’s Day theme. The NHL has been blessed with plenty of Pats and Patricks over the years, and they’ve combined to create several memorable moments that are ripe for an arbitrary ranking. Lots of YouTube videos, with not too much thinking required on your part. Or mine, if we’re being honest. One ground rule: Each Patrick can have only one moment on the list, because otherwise the entire thing would just be one guy. Also, we’re looking at Pats and Patricks here; we will not be including anyone named Patrik or Patrice. Because screw guys named Patrice, that’s why. So let’s do this … the Top 10 Most Memorable NHL Moments From Hockey’s Pats and Patricks. Around the NHL, Patrick Marleau is known for three things. He’s the Sharks’ all-time leading scorer. He holds the modern record for the best start to a season, scoring 11 goals in his first four games in 2012-13. And he has, without question, the greatest eyebrows in league history. Wait, I guess that’s four things. Math is hard. In Vancouver, he may wind up with another claim to fame: as the player who ended the Canucks’ run as one of the league’s best teams. After a dominant run that included back-to-back Presidents’ Trophies and an agonizing seven-game loss in the 2011 final, the Canucks went into their 2013 first-round matchup against Marleau and the Sharks as slight favorites. Instead, San Jose took a 3-0 series lead into a fourth game that wound up in overtime. That’s when Marleau showed up with the dagger. The loss was the last game in a Vancouver uniform for Cory Schneider, cost coach Alain Vigneault his job, and set the Canucks down the road to this season’s disaster. As for Marleau, the goal was just one more piece of evidence that Jeremy Roenick was wrong about him. 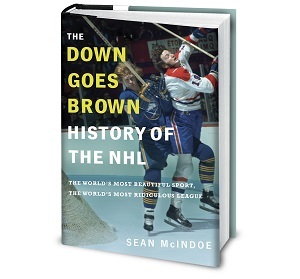 The NHL has a long history of ugly violence. The 1970s and ’80s featured a number of bench-clearing brawls, some of which came before the game even started, and every now and then a team would randomly climb into the stands and start beating fans with shoes. So you might assume that any fight that ended up setting the all-time record for total PIMs in one game would probably be an epic battle featuring bloodshed, flying teeth, and maybe samurai swords. Not quite. As we can see at the 4:15 mark of the clip below, the league record actually ended up being broken by a tickle-fight between Patrick Sharp and Jason Spezza. This, of course, is from the infamous Senators/Flyers game in 2004 that featured two line brawls, several additional fights, and a group of officials who wet their pants and started handing out multiple misconducts to every player who got even vaguely involved. That last bit helped push the game’s PIM total into record territory, and the Sharp/Spezza scrap was the one that put it over the top. Despite it lasting just five seconds, the referees decided the fight was worth a combined 60 minutes in penalties. Sixty! Imagine if any of the punches had landed. By the way, I’ve always enjoyed the way Sharp’s Wikipedia page includes this disambiguation link: “For the Scottish theologian, see Patrick Sharp (theologian).” Blackhawk fans, does Patrick Sharp have a cool nickname yet? If not, can I suggest “The Scottish Theologian”?